GEI Luncheon in honor of Ms. Emma Marcegaglia, President of Confindustria – New York, December 9, 2010 – Remarks by Lucio Caputo – President of GEI. It is my great pleasure indeed to welcome to GEI Emma Marcegaglia who is the President of Confindustria that, as you know, is the main organization representing Italian manufacturing and services companies. Born in Mantua, Emma Marcegaglia holds a Degree in Business Administration, with first class honors, from the Bocconi University in Milano and a Master in Business Administration from the University of New York. Emma Marcegaglia is the Managing Director of Marcegaglia S.p.A., a leading group in steel processing, and of its controlled companies. She is also the President of Mita Resort, the company in charge of running the Forte Village touristic resort in Santa Margherita of Pula (Cagliari). She is also on the Board of Directors of the Bracco and Gabetti Property Solutions. In the past she was the President of Società Turismo & Immobiliare, Vice President of Italia Turismo, Member of the Management Board of Banco Popolare of Italcementi and Indesit and Member of the Board of Directors of Finecobank. At Confindustria she was the National Vice President of Confindustria Young Entrepreneurs from 1994 till 1996 and the National President from 1996 till 2000. She then took the position of Vice President of Confindustria for Europe from 2000 until 2002, Vice President with a proxy for infrastructures, energy, transport and the environment from 2004 to 2008 and Italian Representative in the High Level Group for energy, competitiveness and the environment created by the European Commission. 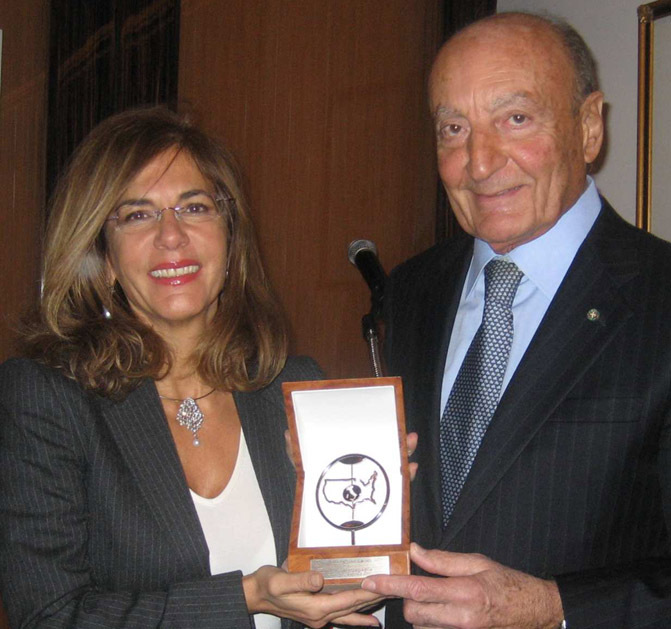 In May 2008 Emma Marcegaglia became the President of Confindustria. As president she has had a very prominent role in the Italian industrial, economic and political arenas representing the interests of Italian companies to leading political & administrative institutions, including parliament, the government, trade unions and other social partners. Emma Marcegaglia’s presidential activities at the Confindustria over the past two and a half years have earned her a lot of public recognition and respect. I will not go into detail about all of her contributions as president because they are so well-known and celebrated and they have been largely reported by the Italian and foreign press. Therefore it is with great personal pleasure that I present Emma Marcegallia with the GEI Friendship Award in recognition of her many accomplishments. The luncheon was held on December 9, 2010 in the Stella Private Room of Le Cirque restaurant in New York City.